This past holiday season hoverboards have been one of the most popular items this past holiday season. As a result, we have received numerous phone calls regarding U.S. Customs and Border Protection (“CBP” or “Customs”) intense examinations of these products. The reason being is that there have been cases where these hoverboards burst into flames due to counterfeit batteries being used to power them. 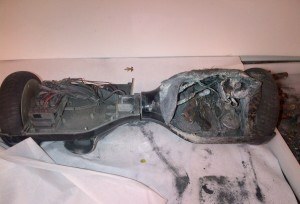 See here http://nypost.com/2015/12/30/hoverboard-bursts-into-flames-inside-a-brooklyn-apartment/. This led to intervention by the Consumer Product Safety Commission (“CPSC”), the federal agency regulating the safety of consumer products nationwide. Customs and CPSC work closely to ensure the safety of products that are imported in the U.S. Customs is the “enforcer at the border” and enforces not only their own regulations but the regulations of all third party federal agencies. Here, importers must ensure the quality of these hoverboards before importation. Make sure the factory you purchase from has a licensing agreement with the trademark holder of the battery inside. If you are dealing with an agent in a foreign country make sure you get a paper trail leading to the trademark holder. Once these goods arrive at the port of entry there is generally no turning back. The trademark holder is unlikely to offer any assistance if the batteries are counterfeit and Customs will detain, seize, forfeit and destroy these goods. Meaning the importer is out the money spent to their supplier for the purchase of the goods and Customs may come after the importer for penalties (if you receive a penalty contact a Customs and International Trade expert immediately). How can this mistake be avoided? Make sure you get a full understanding of what you are buying, the components (and packaging) comprising a product are just as important as the product as a whole. A minor mistake will cost you, and seizure will not be remitted because of ignorance. Further, Customs will have you flagged as a potential violator and you may see an increase is examinations (and delays) at ports of entry. Thus, if there are any trademarks on the goods, seek documentation supporting their legitimacy. If you need help with identifying issues or verifying documentation contact an attorney experienced in Customs and International Trade law. For more information about this blog post, please contact Abady Law Firm, P.C. and speak with our customs attorney at (800) 549-5099. Also visit www.customsesq.com to chat with a customs and international trade attorney — about your company’s import/export situation and to schedule a consultation. To chat with us, click the bottom right corner tab of our homepage.